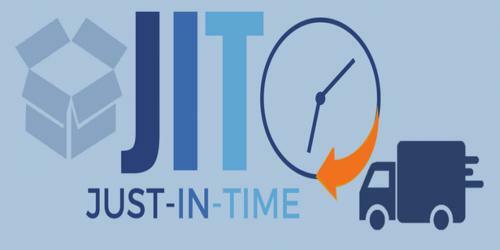 Just in time inventory, also known as JIT inventory, is the reduced amount of inventory owned by a business after it installs a just-in-time manufacturing system. It is a management strategy that aligns raw-material orders from suppliers directly with production schedules. The intent of a JIT system is to ensure that the components and sub-assemblies used to create finished goods are delivered to the production area exactly on time. There are a multitude of improvements related to JIT inventory, particularly in relation to reduced cash requirements and the ease with which manufacturing problems can be uncovered. This method reduces costs by minimizing warehouse needs. Companies also spend less money on raw materials because they buy just enough resources to make just the ordered products and no more. Working capital. JIT inventory is designed to be exceedingly low, so the investment in working capital is minimized. Obsolete inventory. Since inventory levels are so low, there is little risk of having much obsolete inventory. Defects. With so little inventory on hand, defective inventory items are more easy to identify and correct, resulting in lower scrap costs. Process time. A thoroughly implemented JIT system should shorten the amount of time required to manufacture products, which may decrease the quoted lead times given to customers placing orders. Engineering change orders. It is much easier to implement engineering change orders to existing products because there are few existing stocks of raw materials to draw down before you can implement changes to a product. Reduced set up time: Reducing the setup time enables the company to lessen or eliminate inventory for “changeover” time. The tool involved herein is SMED (single-minute exchange of dies).